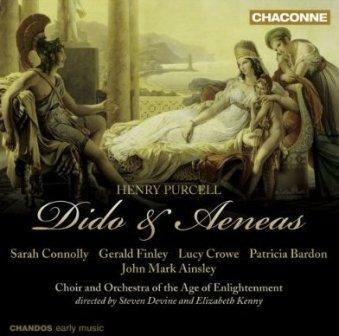 Music history isn't all about progression: Purcell's Dido and Aeneas, amongst the earliest operas to remain in the repertoire, remains as potent, seductive and immediate today as it must have felt at its premiere. It may not be of epic Wagnerian dimensions, either in length or the number of people required to perform it, but Dido is as ideal a synthesis of music, word and gesture as you could hope to find. The leading Dido of our day, Sarah Connolly, has performed the opera in numerous settings: we reviewed her in two different presentations last year, including one at the Wigmore Hall and one, given with puppets and the Orchestra of the Age of Enlightenment, at the Queen Elizabeth Hall. This new recording from Chaconne (Chandos' Early Music label) took place as a result of the collaboration with the OAE at the instigation of Connolly herself. There is no conductor, but none is missed, and an all-star cast of baroque specialists contribute to an atmospheric period instrument recording with much to recommend it. Chief amongst the pluses, of course, is Connolly's assumption of the role of Dido. I've never heard her in better voice, and she's technically impeccable: the tessitura is perfect for her, the ornamentation is employed tastefully, and diction is clear. However, what comes across more than anything is her total psychological understanding of the part. Connolly truly etches a journey between 'Ah! Belinda' at the start and 'When I am laid' at the end; her death is the most moving catharsis of all the tensions that have come before. The mezzo will make her long-awaited Royal Opera debut in April in this opera: don't miss it. The other singer who stands out for me is Patricia Bardon, an absolutely extraordinary Sorceress. Bardon's prowess in the baroque repertoire, as evinced by recent performances of Tamerlano and Partenope for instance, is second to none, and here the rich, contralto tone of her voice is matched with an unerring sense of text, often coming close to spitting out the words with fire. Fine, too, is Gerald Finley as a masculine but sensitive Aeneas, another demonstration of this artist's flexibility and breadth of repertoire, and the up-and-coming soprano Lucy Crowe continues to build her reputation with a pure and poised account of Belinda's music. John Mark Ainsley is luxury casting as the First Sailor, excellent in his brief appearance in the sailors' little dance at the start of Act III, while the countertenor William Purefoy is ideal as the Spirit, his eerie delivery suiting the message he gives to Aeneas down to the ground. Sarah Tynan's Second Woman, Carys Lane's First Witch and Rebecca Outram's Second Witch complete a fine line-up of singers. Of note in this recording are stretches of additional music suggested by Sarah Connolly to fill out some of the score (making the disc's running time up to 69 minutes). So we have Steven Devine playing the Almand from Purcell's G minor keyboard suite, improvisations based on a chaconne by Francesco Corbetta and a passacaille by Louis XIV's guitarist Robert de Visée, and Bruce Wood's recomposition of the lost chorus 'Then since our charms have sped', which runs into a dance from Purcell's Circe. The OAE is magnificent throughout the recording, led by two continuo-playing musical directors, Elizabeth Kenny and Steven Devine, and the contributions of the Choir of the Enlightenment are similarly impeccable. Throughout, both ensembles blend an understanding of period style with a dedication to the immediacy of the drama. Recordings of Dido are numerous, and in all honesty I can't say that this is uniformly superior to all the others. Nevertheless, it's a worthy contribution to the catalogue and will be indispensable listening for those who love the piece.